Stay in one of 4 guestrooms featuring flat-screen televisions. Bathrooms have showers and complimentary toiletries. Conveniences include desks and coffee/tea makers, and housekeeping is provided daily. Located in Kingussie, Sonnhalde Guest House is within a 5-minute drive of Kingussie Golf Club and Highland Folk Museum. This guesthouse is 21.5 mi (34.5 km) from Cairngorms National Park and 21.4 mi (34.4 km) from CairnGorm Mountain. Located in Kingussie, Duke Of Gordon Hotel is a 1-minute drive from Kingussie Golf Club and 7 minutes from Highland Wildlife Park. 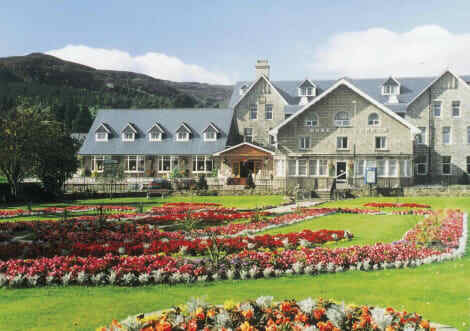 This hotel is 21.4 mi (34.5 km) from Cairngorms National Park and 21.4 mi (34.4 km) from CairnGorm Mountain. Enjoy a satisfying meal at McInnes House Hotel serving guests of McInnes House Hotel. Quench your thirst with your favorite drink at the bar/lounge. Full breakfasts are available daily from 8 AM to 10 AM for a fee. Enjoy a satisfying meal at The Cross at Kingussie serving guests of The Cross at Kingussie. Full breakfasts are available for a fee. Deep in the Scottish Highlands by the crystalline River Spey is the town of Kingussie. Surrounded by the wild and beautiful Cairngorms National Park, Kingussie is almost precisely located in the centre of Scotland. Here is your ideal base for exploring the breathtaking Highlands. In the rain shadow of the Monadliadh Mountains, rainfall here is relatively low, making the climate closer to parts of Scandinavia. The valley is home to acres of ancient birch forest and overlooks the UK's largest flood plain nature reserve with its huge population of breeding water birds. The nearby Cairngorm plateau is one of the UK's wildest places and the last remaining fragment of Arctic/Alpine habitat here. On the mountain slopes, smaller lochans provide homes for gleaming dragonflies and damselflies. Everywhere, pure clean water flows down the valley sides into the Spey, where numerous fish teem. Wander through this glorious landscape and you will be struck by the sheer abundance of greenery. Lichen clings to rocks and trees at every turn: a sure sign that the air is exceptionally clean. Is there a better environment for rejuvenation and total relaxation? Partly because of its strategically important location on a key route between the north and south, Kingussie has made its mark on Scottish history. It was important during the Wars of Independence in the era of Robert the Bruce and William Wallace and during the Jacobite rising, four centuries later, the barracks at Ruthven found itself under siege on two occasions. The name Kingussie is derived from the Gaelic, which translates as ‘the head of the pine wood', because before the 18th century the community lay at the tip of a vast swathe of pine forest. The original settlement in this area was at Ruthven, where the Comyn Earls of Badenoch created a stronghold above the crossing of the Spey. By the 14th century, the castle was home to the notorious Wolf of Badenoch, who is perhaps best known for laying waste to the town and cathedral of Elgin in 1390. You might be in the wildest part of the UK, but there are still plenty of excellent places to relax and enjoy authentic local produce, imaginative cooking and friendly cafés. The Cross at Kingussie is an AA 5-star restaurant set in a tranquil riverside location, that features in the Michelin Guide 2014. They know exactly how to bring out the wonderful flavours in all those local seasonal treats. For freshly ground Italian-style coffee, home baking and a warm welcome, make yourself comforSEOSITE_LEVEL_DESCRIPTION in The Teapot. Right on the High Street, the Tipsy Laird is a popular, vibrant welcoming pub where you can sample an excellent all day menu, chef's specials and desserts that are updated on a daily basis. Make your choice from the range of Kingussie hotels and embrace the heart of wild Scotland and its unique hospitality.